To Cite: Shahbazzadegan B, Samadzadeh M, Feizi I, Shafaiee Y. Management of Esophageal Burns Caused by Caustic Ingestion: A Case Report, Iran Red Crescent Med J. 2016 ; 18(11):e12805. doi: 10.5812/ircmj.12805. Introduction: Domestic and industrial swallowing of caustic substances can cause acute and chronic injuries. In the acute phase of care, focus is on the immediate control of tissue damage and perforation, and in the chronic phase, the focus is on the treatment of pharyngeal narrowing and impaired swallowing. Case Presentation: The patients of this report were an 18-year-old man and a 20-year-old woman, who had esophageal burns after ingesting chemicals, and for solving their nutritional problems, such as difficulty in swallowing, they had underwent surgery. Patients had continued follow-up after surgery. Conclusions: Treatment of esophageal burn lesions is by immediate and delayed removing of damage outcomes. Despite many attempts to reduce household cleaners and other caustic materials, gastrointestinal and respiratory tract burns following their use, is still one of the greatest economic and social problems of our society. In the acute phase, the severity of injury will vary from superficial burns to deep severe burns with visceral perforation (1). Esophagus due to early and long-term contact with ingested chemicals, subtle mucosal, thin wall and lack of strong defense system, is one of the most important and vulnerable regions of the gastrointestinal tract following ingestion of caustic chemicals (2). Injuries caused by these substances can vary from minor to life minatory situations such as perforation, shock and bleeding in the acute phase and heavy complications (stricture and finally increased risk of esophageal cancer) in the chronic phase (3). Almost half of caustic ingestion situations can lead to esophageal damage that can lead to major complications depending on the severity and extent of the damage (2). Most caustic ingestion situations in infants were unintentional and due to lack of awareness, and the probability of extensive and severe lesions was weak. However, strong ingestion such as alkaline substances without smell and taste may cause severe burns and lethal effects (4). Acidic and alkaline substances affect tissue by different methods. Alkaline substances break down tissues and affect deep tissues, while acidic material can cause coagulation necrosis that limits perforation. Several methods are used to estimate and evaluate lesions caused by caustic ingestion. Simple radiography in suspicious cases of perforation, radiography with contrast, CT scan with and without contrast, nuclide radio scan and endoscopy because of sensitive and accurate information in the acute phase after ingestion, were the selected methods for the estimation of severity and extent of the burns. 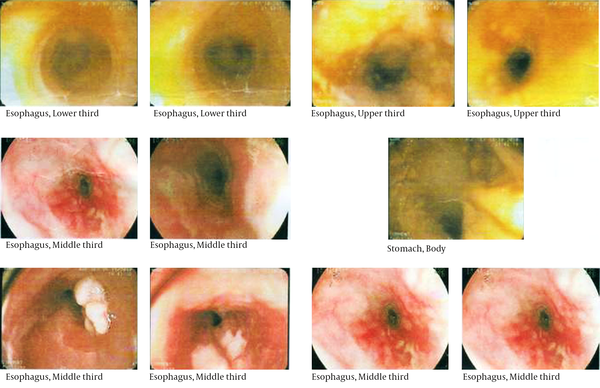 Clinical features of esophageal burns are determined by the degree and extent of injury. In the initial phase, there are complaints from mouth and sub-external areas, increased salivation, pain in swallowing and dysphasia. Fever is associated with esophageal lesion. Bleeding can occur followed by vomiting. The primary complaints disappear during the period between injury and granulations. During the scaring phase, patient complaints begin due to fibrosis and traction that can cause narrowing of the esophagus. Urgent treatment is through limitation of burns with injection of neutralizing chemical drugs; this must be done one hour after the burning incident. Esophageal extensive necrosis caused perforation that can be treated with resection. In these patients the biopsy must be done from the posterior wall of the stomach to reject hidden damage. The patients were an 18-year-old man and a 20-year-old woman, who had developed esophageal burns after ingesting chemicals, and for solving their nutritional problems, such as difficulty in swallowing, they had underwent surgery in Ardabil city of Iran during the year 2010. The 18-year-old man with a history of acid ingestion since one and a half years ago, and nutritional problems such as dysphagia and odynophagia, was hospitalized with diagnosis of esophageal stenosis. The patient had no history of diseases and his paraclinical tests were normal. Examination of the esophagus after swallowing barium, revealed that different parts of the esophagus had severe narrowing (aortic arch to the distal part) due to stricture and severe narrowing in area of gastro-esophageal junction. Esophageal parietal changes with reduction of diameter with parietal stiffness symptoms and deformation of the distal part of the stomach and duodenum were shown by radiography with barium (Figure 1). The second patient was a 20-year-old female with a history of detergent ingestion that had caused burns in the esophagus. The patient did not have a history of certain diseases and paraclinical tests were normal. The patient had undergone cervical esophagostomy with jejunostomy. Surgery of the first patient was performed in one step. This patient had undergone thoracotomy and esophagostomy followed by laparotomy and esophagus replacement with descending colon as a transmediastinal, and proximal anastomosis of left colon to cervical esophagus and anastomosis of the side of the colon to the side of the stomach and anastomosis of end colon to loops of jejunum. The second patient’s surgery was performed in two steps. The first stage included the following procedures thoracotomy, esophagostomy, cervical esophagostomy and embedded jejunostomy feeding tube to improve nutrition. The second stage was performed after three months, and included esophageal replacement with the descending colon as the substernal section, colon anastomosis as isoperistaltic to cervical esophagus in the neck, anastomosis of the side of the colon and the side of the stomach, and anastomosis of end colon to jejunum loop in the abdomen. If a person is suspected of ingestion of large quantities of acidic or alkaline substances according to history taking, physical examination, and upper endoscopy, strict evaluations are necessary. It should be considered that the presence of a symptom or sign alone cannot be used to predict the degree of injury. Accidental swallowing of caustic materials can cause serious damage to the gastrointestinal tract. This damage occurs in the esophagus because it is the most delicate and defenseless tissue and at the same time, has the greatest contact with ingested caustic substances (2). Dilatation is the first step for cases where stenosis is caused by swallowing caustic chemicals. Dilatation can be done by different methods but the maximum time should not exceed one year (5). Several methods are used in therapeutic centers to replace the esophagus and each of these methods has its own merits and flaws. Common alternative methods include gastric tube, jejunum loop and colon interposition (5, 6). Maier et al. (7) have proposed using of the jejunum loop method as the best method. Our literature review revealed that the colon interposition is the most common and useful method for esophageal replacement, as the colon is able to provide suitable length (5, 8, 9). Najafi and colleagues in 2007 showed that esophageal injury happens with different severity in children after caustic ingestion (2). Azadegan and Amini Ranjbar (10) in their study showed that none of the clinical symptoms and laboratory findings could reject the requirement for endoscopy in patients with a history of caustic ingestion. Park (11) in his study concluded that in most adult patients, it might be beneficial to perform an upper GI endoscopy within 24 hours to evaluate the degree of tissue injury. This can help determine the treatment options and predict prognosis. However, endoscopy is usually contraindicated in patients with hemodynamic instability, possible perforation, severe respiratory insufficiency, and severe swelling of the larynx or oropharynx. Patients with a moderate to severe level of injury should be admitted to the ICU where they should be strictly monitored for life-threatening complications. In addition, if complications such as mediastinitis, peritonitis, and other signs indicate perforations, emergency surgery is required (11). We thank Dr Iraj Pourfarzan and the personnel of Fatemi Hospital of Ardabil city for their assistance with the current study.